This is an exerpt from an older SNAMP newsletter Marek and I wrote describing the use of lidar in our Sierra Nevada Adaptive Management Project. Originally published November 2008. Environmental sciences are inherently spatial, and geospatial tools such as Geographical Information Systems (GIS), Global Positioning Systems (GPS) and remote sensing are fundamental to these research enterprises. Remote sensing has been used for forest and habitat mapping for a long time, and new technological developments such as LIDAR (light detection and ranging) are making this ﬁeld even more exciting. Here we brieﬂy describe LIDAR’s basic principles and show some preliminary analyses completed for the SNAMP Project. We are using this data to model detailed topography to help the water team understand runoff in the SNAMP watersheds, to map forest canopy cover and vegetation height as inputs to the ﬁre and forest health team’s detailed ﬁre models, and to derive important forest habitat characteristics for the spotted owl and ﬁsher teams. density of 9 points per m2. Raw Data: LIDAR data is typically delivered as a “point cloud,” a collection of elevations and their intensities that can be projected in a three-dimensional space. In Figure 2 (right) we show this “point cloud” concept. There are thousands of individual points in the image, each colored according to its height (magenta and red are high, orange and yellow are low). Bare Earth: Once the data is collected, the ﬁrst step is to transform the data into a “bare earth” model; which is an approximation of the ground if all objects above surface are removed. We use the “Last Return” data (see Figure 1 above) to generate this model of the bare earth. These are typically very detailed products (with a small footprint on the ground) and provide much more topographic information than from Digital Elevation Models (DEMs) that were derived from topographic maps. Our DEM has a ground resolution of under 1m. Forest Structure: Another typical step in processing LIDAR data is to examine individual trees and forest structure. An example of a forest stand is shown in Figure 4. These and other products help us understand how the forest inﬂuences surface hydrology, how a patch of forest might provide habitat for a ﬁsher and how a forest might burn given certain weather and wind patterns. Future Analyses: We are in the process of linking the forest parameters gathered by the Fire & Forest Ecosystem Health Team in summer 2008 with the LIDAR-derived data to help scale-up forest variables to the ﬁreshed scale. For example, tree height, tree DBH (diameter-at- breast-height) and canopy cover have been successfully modeled using LIDAR data in other studies, and there is active research linking ﬁeld-based and LIDAR-based ﬁre-related measures such as canopy base height and ladder fuels, and wildlife-related measures such as vertical structure. Our friends from DataBasin are on campus on Monday. Kai Henifin is a Cultural Ecologist/GIS Analyst with the non-profit organization Conservation Biology Institute, the developers of DataBasin. Kai will be speaking about "Incorporating Indigenous Knowledge to Improve Conservation through Data Sharing" as part of the Berkeley Indigenous Mapping Network. For more info on the event. We have some interesting cross-overs with CBI and DataBasin: we added our SOD data to DataBasin recently (see image at left); and CBI have a nice modeling project looking at fisher in the southern Sierra that Reg and Rick are using in their SNAMP work. As a lead-up to this week's SNAMP Spatial Team Workshops on our LiDAR data, I am collecting the great web resources for LiDAR here. Related to our SNAMP work, and the research Celia is doing here: this NASA highlight article featuring Ralph Dubayah's Sierra forest work. Must follow up on this. Watching closely, originally uploaded by SNAMP Photo Collector. Marek found this fellow watching him on the way home from field work. You know why: All the burning in Northern California is shown via the NASA hazards site. I haven't seen any perimeter maps yet. 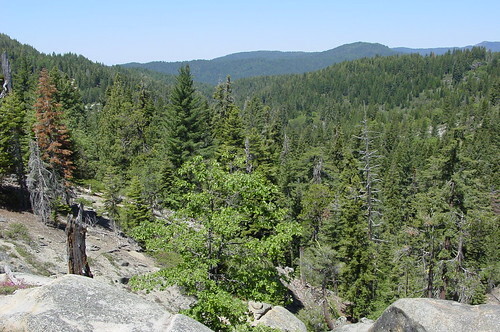 Appeals court stops feds plan to log Sierra Nevada forest - The Associated Press /Published 11:37 am PDT Wednesday, May 14, 2008/ A federal appeals court has barred logging in the Sierra Nevada forest. The 9th U.S. Circuit Court of Appeals says the federal government failed to explore other ways to raise money to fight forest fires when it approved a plan to award timber contracts to cut down trees on three sites. The Forest Service says the logging of commercially valuable trees is needed to help pay for thinning of less desirable smaller trees and brush. 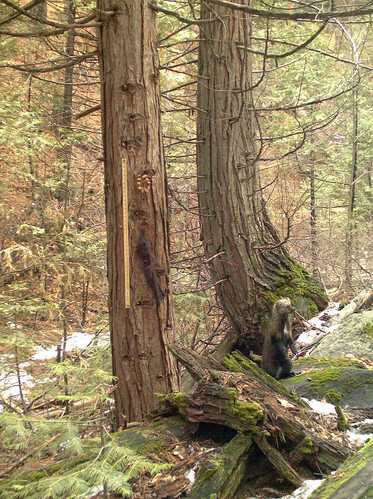 Environmental groups say the logging plan fails to protect scarce species such as the California spotted owl, martin and Pacific fisher. Attorney General Jerry Brown joined the environmental groups in appealing a lower court decision last year that authorized the government to allow the timber contracts. We'll keep you posted. Daylight Fisher!, originally uploaded by SNAMP Photo Collector. Check out this cutie. A fisher from the SNAMP project. Marek was flying over this guy last week. 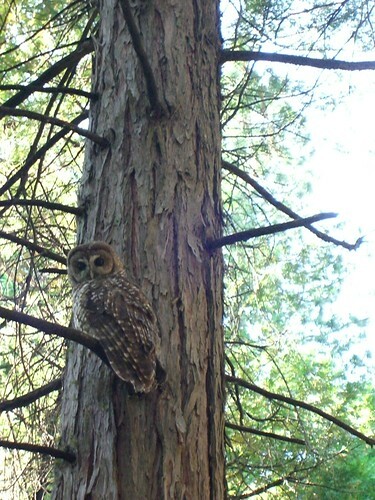 Spotted Owl in the news. Overlooking the southern site, originally uploaded by SNAMP Photo Collector. Here are some nice examples of "storymapping" projects given to me by SNAMP collaborators. Check out: Story Mapping Project, Saving the Sierra; and Community Walk.